In all honesty, we were less confident that the markets would reach such depths last month as things seemed to be quieting down. Nonetheless, I think we will all agree that volatility is here to stay and just when things seem to be "normalizing" the market will prove otherwise. We must admit that, despite our trading profession, we are a little disappointed in the short-term attitude that investors have adopted. The buy and hold philosophy that worked so well for Warren Buffet and was spoon fed to finance majors everywhere has all but dissipated and it will likely take several years before traditional investing is considered acceptable again. Unfortunately, the short-term trading mentality dominating the markets may be, aside from a dismal economy and banking system, the primary factor holding the markets back. All rallies are being viewed as opportunities for the bears and until this changes a sustainable rally will be hard to come by. Active equity trading has been made increasingly popular by products such as ETF's (Electronically Traded Funds). Many of these funds are constructed to make money in a down market. In other words, by simply buying a short or ultra-short (leveraged) ETF the average retail investor can place a bet on lower stocks. In recent years, nearly $9 billion has made its way into such funds. However, the light at the end of the tunnel is that many of the same funds, who are trading in short futures and derivatives, have actually lost money as the market lost value for those that bought a short fund ETF and held the position. Those that did make money on such ETF's were slapped with hefty tax burdens. Investors that were burned on the way down with traditional long only funds and then again in their supposedly short funds may leave the market all together. While this sounds like a negative, it will eventually work in favor of equities. That said, it seems as though the bull won't resurface until later this year. We suspect that we will see some sort of low in the summer months. In the near term, we are reluctant to put too much faith in the current rally. After all, those that trusted up moves in the past likely regretted doing so. Trading is about identifying patterns and using them to your advantage and short-lived rallies have been the norm. Additionally, late March is notorious for being highly bearish for stocks and recent government policy could breed panic rather than confidence. While the market seemingly accepted the Fed's pledge to take a path that has historically failed (manipulating interest rates by buying its own Treasuries), we may see a case of buyer's remorse in the coming weeks. There is obvious technical and psychological resistance in the S&P near 800 and we doubt that the market will be able to sustain gains above this level in the end. 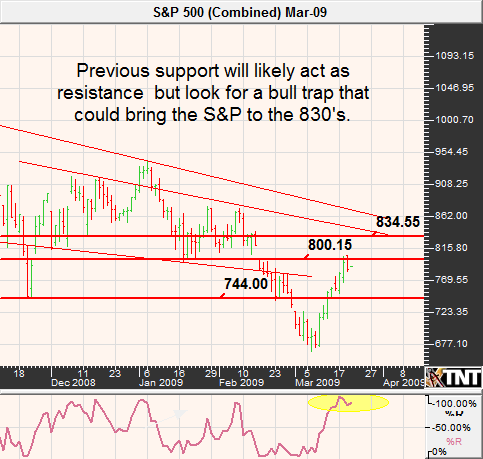 However, we do respect the possibility of a bull trap that could run out of steam in the mid 830's. 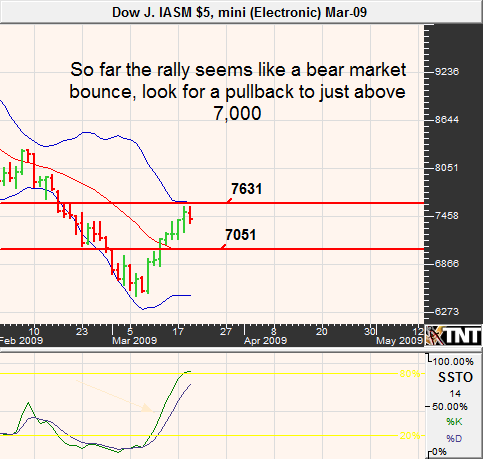 If we are right, the S&P should pull back to 735 and possibly even retest the recent lows near 666. Keep in mind that commitment of traders data suggests that commercials and large speculators are heavily short the stock indices. It is the small speculators that are long the market. That said, April is typically the best month for the Dow so being too bearish is likely a bad idea. Instead, bearish traders should be nimble and humble. At the current juncture, T-bond prices have retraced approximately 50% of their rally that began in the fall of 2008. 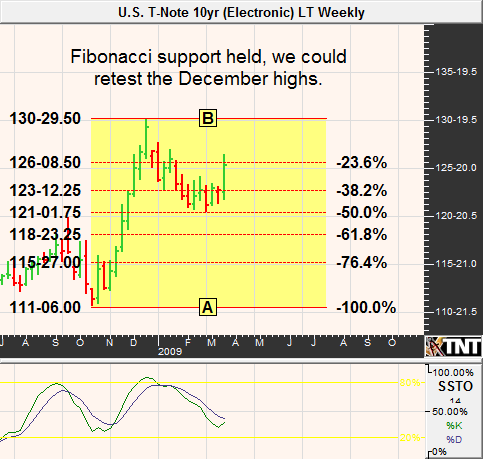 A continuation of the slide to the 61.8% Fibonacci level will mean that the March bond will trade lower to the 123 area. Coincidently this is also the area that marks two standard deviations from the mean. In other words, statistically the market should at least temporarily remain above 123. We like the idea of being bullish at such levels through the means of short put options, or an aggressive option spread. Likewise, note traders may find value in being bullish near 121 and preferably 120'15. This time around, we are a little less certain in our analysis. The Fed's recent last ditch effort to manipulate market interest rates through quantitative easing (buying its own Treasuries) is essentially printing money; lots of it. We have already seen what it has done to the dollar; based on historical standards we can be nearly certain that inflation will once again play a large part in our economy and we also know that the Fed's spending spree will almost certainly involve more bond and note issues. All of these issues are highly bearish and combined with the seasonal weakness that typically begins in late March, there may be reason to believe that this could be one of the greatest selling opportunities of all time. However, it is what we don't know that could work in favor of Treasuries and makes us believe that bonds and notes will trade higher before they make their way lower. I can't help but believe that market participants, small businesses and the average American will continue to alter their spending and entrepreneurial habits to a more conservative stance and this could translate into additional safe haven Treasury buying. The magnitude of the policy that that Fed has just committed itself, and our tax dollars, to is a sign of panic. It seems as though they may have finally fired their last bullet while the rest of us were focused on more entertaining stories such as the AIG bailouts but with one hand on the printing press there is not telling how many times that bullet will ricochet. I don't know of a single speculator with pockets deeper than the Fed. This may keep some sellers out of the market in the near-term. Also supporting the idea of higher bond and note prices is the unprecedented number of bearish sentiment in regards to Treasuries. As I have mentioned in the Bond Bulletin, the equity industry has recently introduced ultra-short Treasury ETF's in which "investors" stand to profit from leveraged declines in Treasuries. Typically once a product is developed and approved by the SEC the fad is nearly over, and that may be true in this case. 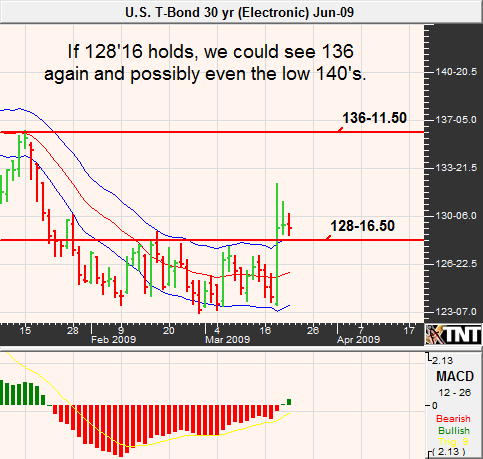 New support in the June 30-year bond is 128'16 with the next major floor being near 126'08. Despite this week's erratic spike higher, we believe that we could see a counter seasonal move to just above 136 and depending on equity trade maybe even 142 in early April. 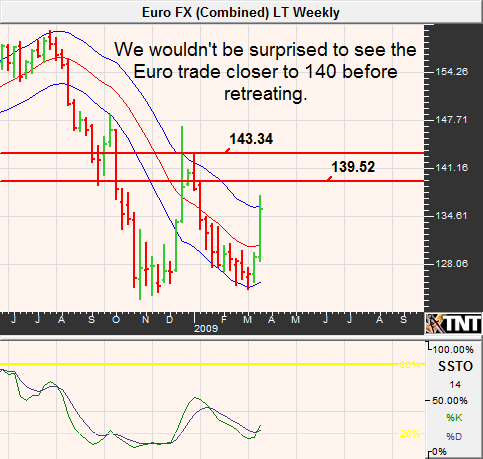 Similarly, we think that the 10-year note could trade above 130, and maybe near 131 before this move is exhausted. If we are wrong, look for the note to retrace to 121'20. While in early 2009 the grain complex had nearly forgotten about the U.S. dollar and its implications on export demand, the recent plummet in the greenback has been a startling reminder. The Fed's announcement in regards to Treasury re-purchases shook up the financial markets but the aftershocks made their way into the agricultural markets. The immediate de-valuation of the dollar set commodity prices on fire with corn and soybeans being direct beneficiaries. According to COT data (Commitment of Traders) commercials and large speculators are long the grains at current levels while small speculators are short. 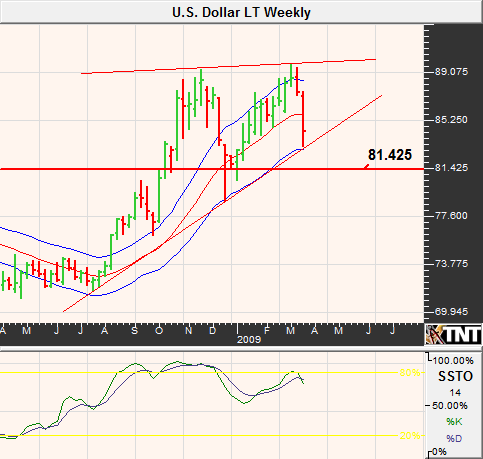 We believe that aside from a near term bounce; the U.S. dollar index could make its way lower to the 81 area. If this is the case, we should see enough buying pressure to squeeze the small speculators out of the market and propel grain prices temporarily higher. 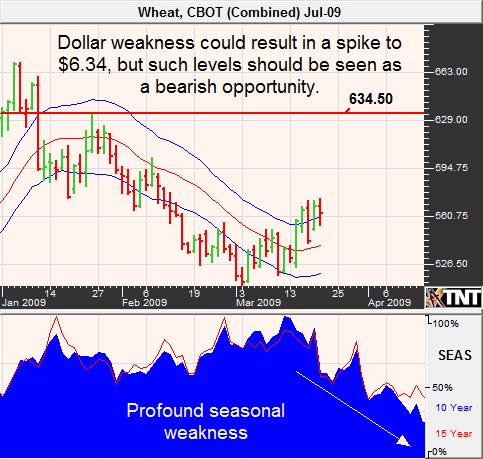 Planting concerns tend to make April a positive month for grains. Also, the South American soybean harvest begins in the coming month and uncertainty tends to be supportive for prices. According to data accumulated by the USDA and released in late February corn fundamentals are pointing higher. Decent exports, a short crop in Argentina and ethanol subsidies have kept the demand side of the equation healthy. Accordingly, corn ending stocks are expected to drop 1.72 billion bushels by the end of 2009/10. The powerful move in May corn above $3.72 suggests that the market will likely make its way to $4.30 before running into significant resistance. Keep in mind that oversold near-term conditions in the U.S. dollar may lead to temporary digestion in corn before the rally resumes. However, without a complete meltdown of the U.S. dollar we don't expect May corn to surpass $4.30, or $4.40 in July corn. Hints of tight supply in Argentina and a weak domestic currency have helped soybean futures to mitigate oversold conditions. However, thanks to the USDA's late February outlook soybean fundamentals may not be a supportive as once thought. Although expectations are calling for 5 million fewer acres dedicated to soybeans this year over last, it seems as though this prediction could be revised much lower due to high production costs for corn and depressed wheat prices. We believe that near-term bullish fundamentals will eventually fail, but in the meantime we could see soybean futures rally as high as $10.55. You may recall that this is the area in which beans topped out in January. Bulls should look cautiously higher, but a better play may be taking the opposite play near $10.50. There are some near-term fundamentals that could keep wheat prices on the rise including large short positions by small speculators and supposedly trend following funds leaving the market vulnerable to short covering rallies. Also, wheat remains a popular alternative to expensive proteins during recessionary economies and the Fed's resilient injections of capital may benefit wheat before some of the other grains. While we expect to see additional upward price pressure in wheat in the coming weeks but any swift rallies may be great opportunities for the bears. We believe that $6.30ish is possible in the July contract but doubt the prospects of gains above this level due to seasonal pressures. Traders may best be able to play this scenario with short mini-wheat futures or option spread strategies. Those willing to trade full sized futures should strongly consider using options as a hedge, we still haven't forgotten the 2007 wheat rally. In the last newsletter, we were looking for a low in crude oil. "...we are looking for some type of significant low in the energy complex shortly. Also providing support to our bold prediction is the fact that the market has made such a precipitous drop and could be in store for a massive short squeeze. We are looking for the April contract to hold support at or near $40 per barrel and make their way higher to resistance near $45.20 and then again at $48.90." As April approaches, it appears as though the crude oil futures have become slightly overbought and could be in store for moderate selling pressure. 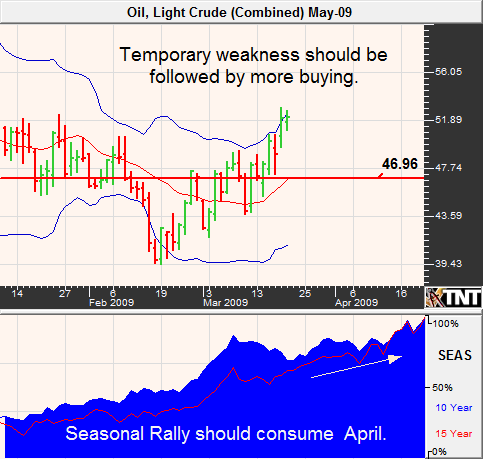 In fact, I wouldn't be surprised to see a pullback in the May contract to nearly $47 per barrel. Nonetheless, we don't believe that the seasonal rally has exhausted itself. The Euphoria over gold and silver has become nearly unbearable (for us anyway). Every business news channel, the business sections of nearly every newspaper and most of the financial magazines that we have run across are all encouraging "investments" in gold and silver. Investors purchased a record $9.7 billion worth of gold last year through ETF's according to the World Gold Council and the U.S. mint can't keep up with production of their American Eagle gold coins. Keep in mind that much of this gold is being purchased at an implausible premium in which the dealers make out like bandits. I have seen this type of media and market hype for precious metals before. Remember the metals crash in the spring of 2006? It is also eerily similar to the propaganda over crude oil futures, ETF's and commodity funds just before its demise in the middle of 2008. 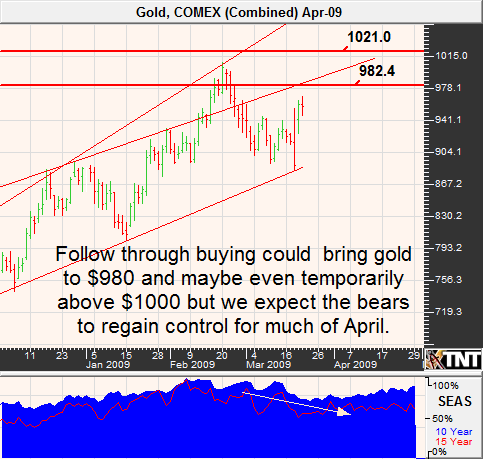 Seasonal and technical analysis suggests that April gold could see a slide of a $100 or more in late February or early March. 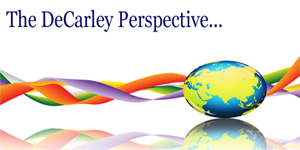 It is not uncommon for metals prices to experience a dramatic pummeling in this time frame. For those looking to play this move, you are likely best off trading the mini-futures contract. The margins are low, and they provide the ability to ride out any adverse moves that could occur before the reversal. Put options are pricy, but an aggressive spread such as a bear put with a naked leg are possible. If interested, contact us for specifics. Silver traders should look for similar action. 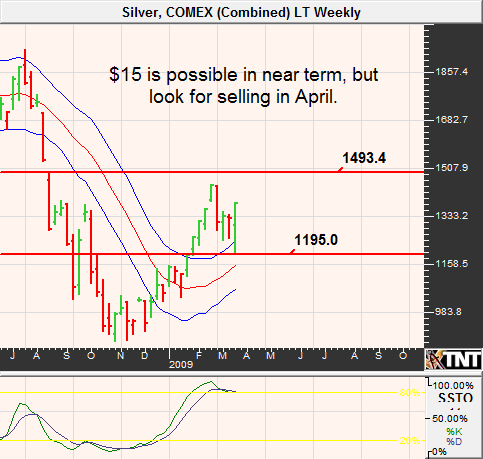 Although, our charts are telling us that silver could run as high as $15, but we become highly bearish at such levels. This month, the call isn't as easy. It appears as though we could be in store for some follow through buying in the metals that could bring gold above $980and maybe even considerably above $1,000. However, if such gains occur we expect that it will be temporary. Keep in mind that we could see some tax related sales in early to mid-April as investors raise cash to pay Uncle Sam. 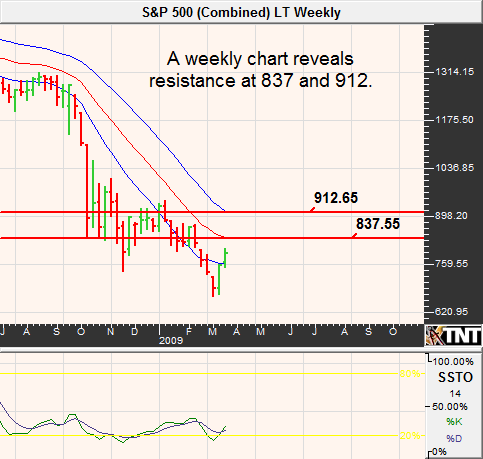 We believe that the pullback could see the low $880's in gold and $12 in silver. The Fed's intention to buy at least $300 billion in Treasuries is essentially like taking an IOU out of one pocket, spending it, and then putting it in the other. The result is a massive injection of cash and if left unchecked could eventually lead to inflation or possibly hyperinflation. Not surprisingly, the U.S. dollar went into freefall on the news. On the other hand, it seems likely that along with the U.S. and Great Brittain, other central banks will adopt similar policies. If this is the case, traders and investors will go back to the "which is the least bad of the bad" and this could bring some stability back to the greenback. With that said, we do believe that aside from what could be an oversold bounce, the June dollar index should trade to the mid 81's and possibly even back to 80 before an intermediate term bottom will be found. Look to be a hedged buyer as the index trades closer to 81. Sugar prices tend to be weak during the month of April due to high inventory from sugar cane harvests in the U.S. and Brazil. Also, ethanol production from sugar in Brazil may be deterred due to a lack of storage options for current inventory. We feel as though the market has already priced in the world production deficit and this keeps the upside limited for now. Additionally, seasonality of sugar should keep a cap on any potential rally. We see heavy resistance in May sugar just under 14 cents and believe that the odds favor a pullback to a little over 13 cents at minimum. From a fundamental perspective, smaller production in Brazil, Colombia and possibly Vietnam has offered market support. As a result, world production could be down as much as 6%. As we have mentioned in previous newsletters, coffee demand is relatively stable even in economic times and that seems to be holding true. However, we believe much of this to be baked into the cake. Our speculation of coffee reaching levels near $1 was accurate, but we weren't necessarily expecting such a strong rebound. As it turns out, fund traders had built a considerably short position and position squaring seemed to be the main catalyst to the rally. We think that weakness in the dollar could bring coffee prices back to $1.20 but if this occurs it will likely be temporary. Patient bears may want to look to construct pessimistic strategies at such levels in anticipation of a pullback to $1.10. According to the USDA, February hog production was down 5% from a year ago. On the other hand, according to the Meat Export Federation, pork exports were down 4% in January from a year ago leaving the fundamental picture mixed. As mentioned in the previous newsletter, producers are losing money at current prices but the subsequent decline in supply takes some time to work its way through the system. May hogs could creep a little higher as technical traders attempt to fill a gap left in February but we doubt that the rally will be able to extend gains much beyond this point. Instead, it seems more likely that prices will retreat through the middle of April that could bring the May contract closer to 69 cents. 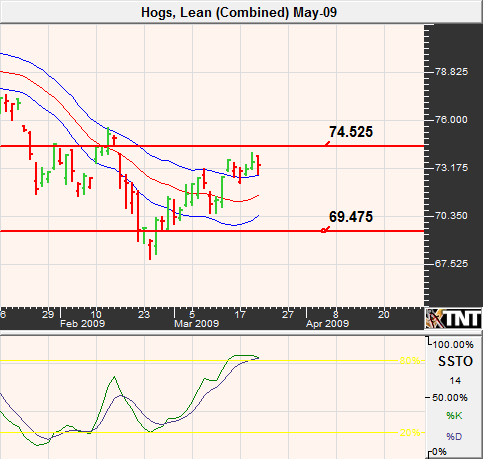 We believe that hogs become attractive again in the mid to low 60's. USDA reductions in predicted beef production and their expectations of lower steer prices have kept cattle futures under pressure. 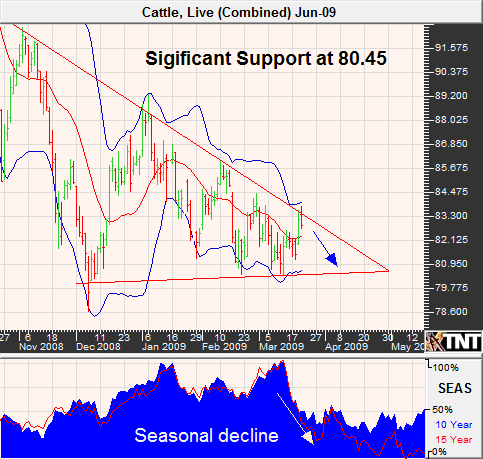 However, beef exports seem to be creeping higher and the weak dollar could contribute to demand. Nonetheless, seasonal pressures and weak trade suggests that the market could be in store for another retest of the lows and will likely keep the bulls on the sidelines. That said, a break out to the upside of the current pennant could lead to swift short covering as small speculators are holding large short positions. It seems like the bulls will be better served by holding out for prices closer to 80 cents as the long side may have better prospects in the April time frame.